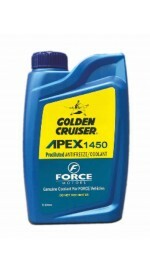 Golden Cruiser Apex 1450 antifreeze coolant is a specially formulated new generation coolant developed to meet the requirement of Force vehicles. Using other coolants, which are not genuine products may lead premature system failure and drop in vehicle performance. 2. Flush the system with soft watre or any good quality radiator flush fluid. 3. Install Golden Cruiser Apex 1450 by directly pouring into radiator till full. 4. Pour into expansion bottle till between the marks.